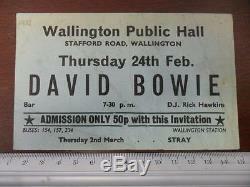 DAVID BOWIE Concert Invitation Feb 24,1972 Wallington Public Hall UK Ticket Stub. ADMISSION ONLY 50p with this Invitation. Busses 154, 157, 234 Wallington Station Thursday 2nd March.. Printed on light blue card stock. Ticket measures 14 x 8.7 cm (about 5&1/2 x 3&1/2 inches) This concert fell after the release of Hunky Dory (Dec 1971) and before Ziggy Stardust (released 6/72). We found this in a book, a 1972 UK paperback printing of Lord Dunsany's Fantasy classic, Beyond the Fields We Know. Looks like it was used as a bookmark. Wallington Public Hall is a hall in Sutton. Built in 1934 with Art Deco features, the venue has hosted a wide range of events. It was closed on 31 March 2015 due to being a poor state of repair. It was originally a cinema, but soon evolved into a theatre hosting a range of productions and performances, including musical theatre and classical concerts. In the 1960s and 70s bands toured a large range of local venues such as Wallington, and in that period nearly every nationally known group appeared. Famous names who appeared here include: Jeff Beck (who was born in Wallington), Jimmy Page, Eric Clapton, Manfred Mann, Joe Brown, Billy Fury, Status Quo, The Kinks, David Bowie, and the Rolling Stones. This piece has been creased and folded in the past but has been pressed flat between the pages of a book for years. In the upper left corner there is a hand-penciled year, 1972. There is some light fading/soiling on top and right edge. Please enlarge pics to see. This will be securely packed for a safe ride to your home. In our auctions this week. Domestic orders will normally arrive within a week. Your satisfaction is our first concern. Get Images that Make Supersized Seem Small. Auctiva's Listing Templates improve your auctions in minutes. Attention Sellers - Get Templates Image Hosting, Scheduling at Auctiva. Increase traffic to your listing with Auctiva's FREE Scrolling Gallery. The item "DAVID BOWIE Concert Invitation Feb 24,1972 Wallington Public Hall UK Ticket Stub" is in sale since Tuesday, January 12, 2016. This item is in the category "Entertainment Memorabilia\Music Memorabilia\Rock & Pop\Artists B\Bowie, David\Concert Memorabilia". The seller is "bmackz" and is located in Houston, Texas. This item can be shipped worldwide.